We show how to make the “authenticated garbling” at the heart of their protocol compatible with the half-gate optimization of Zahur et al. 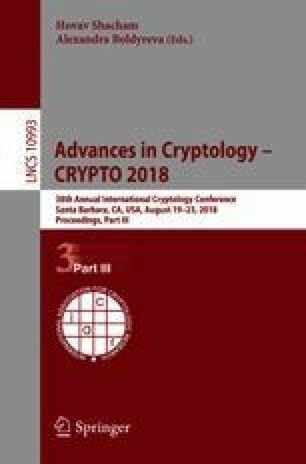 (Eurocrypt 2015). We also show how to avoid sending an information-theoretic MAC for each garbled row. These two optimizations give up to a 2.6\(\times \) improvement in communication, and make the communication of the online phase essentially equivalent to that of state-of-the-art semi-honest secure computation. We show various optimizations to their protocol for generating AND triples that, overall, result in a 1.5\(\times \) improvement in the communication and a 2\(\times \) improvement in the computation for that step. This material is based on work supported by NSF awards #1111599, #1563722, #1564088, and #1617197. Portions of this work were also supported by DARPA and SPAWAR under contract N66001-15-C-4065. The U.S. Government is authorized to reproduce and distribute reprints for Governmental purposes not withstanding any copyright notation thereon. The views, opinions, and/or findings expressed are those of the authors and should not be interpreted as representing the official views or policies of the Department of Defense or the U.S. Government.